Allo was the first app announced at I/O 2016, and now Duo, a mobile exclusive one to one video service has been unveiled. Allo relies on an extremely simple user interface, which aims at simplifying the way we think of apps of this kind. When you open the app, in fact, you’re immediately greeted with a preview of yourself given by your phone’s front facing camera. Then a card with big circle images of your contacts will appear; tap one, and off you go. 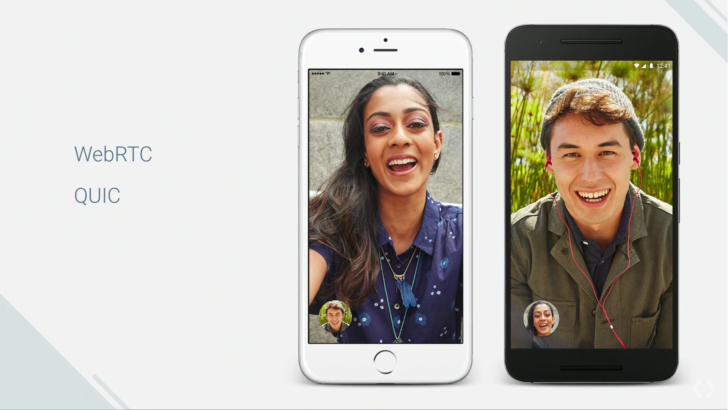 You can toggle the microphone on and off, or you can obviously switch cameras — but that’s pretty much it, because Duo does not aim to be anything but a neat, fast and reliable video calling app. Mostly, it seems like Google‘s engineered worked to make the app immediate and quick, so much so that the moment you’re making the call, a preview of your video will appear on your recipient’s device. Both Allo and Duo are slated for release in the "early summer" this year.